Among the most striking features of the northwestern New Mexico landscape are the more than 130 fortresses and towers built on boulders, promontories, and mesa rims. These "pueblitos" in the traditional Navajo homeland of Dinétah have been a key piece of evidence used by archaeologists to infer a massive immigration of Puebloans into the Navajo country following the Spanish re-conquest of New Mexico (ca. 1700), yet they have never been comprehensively analyzed. Using a database of tree-ring dates taken from beams and wood used to construct these pueblitos, Ronald Towner shows in this volume that most pueblitos are unrelated to Puebloan immigration or the re-conquest. He concludes that Navajos constructed the masonry structures and hogans contemporaneously for protection against Ute raiders and later Spanish entradas. Further, most were occupied for relatively brief periods and population density was much lower than has been assumed. Towner points to a new model of Navajo ethnogenesis, based on a revised early population distribution and a variety of other means of incorporating non-Athapaskan elements into Navajo culture, making Defending the Dinétah a major contribution to Navajo studies. Ronald H. Towner works in the Laboratory of Tree-Ring Research at the University of Arizona. "Towner’s book is the first comprehensive presentation of chronological data on Navajo pueblitos; but he goes much further than just dating them to explore the meaning of this remarkable architecture in terms of the origins of the Navajo." 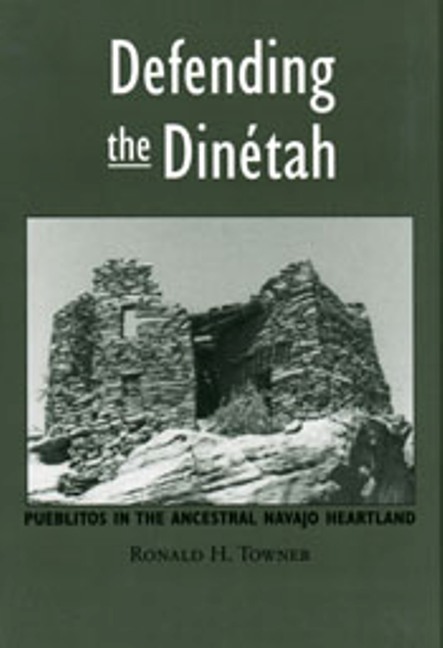 "Defending the Dinétah is both the definitive study on dating pueblitos and a thoughtful synthesis of recent research on ancestral Navajo communities in northwestern New Mexico."